Slow release, recovered phosphorus fertiliser for close mown turf. Ideal for use in areas with high-sand content rootzones. 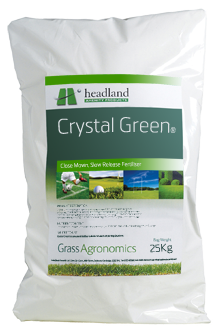 Due to its slow release properties Crystal Green® is an extremely safe product for application to turf. Apply product after cutting to allow for the granule to penetrate the sward between cuts. Water in if application is made during dry, hot periods. For establishment usage, apply the Crystal Green® onto the area to be turfed or seeded and work loosely into the surface. Note: Some immediately available phosphorus will be required.